OMG. Today was way better than yesterday, but it's still a little like medieval torture. Day Two started out with 3 hours of IVs (Iron, Glutathione, and Meyer's Cocktail). Iron: Essential nutrient. Increased energy and easier breathing. Afterward, Adam picked up lunch from Julie's Deli downstairs. Their veggie teriyaki (without the teriyaki sauce) is good. Simple, easy food that doesn't upset my stomach. The IVs were less painful today and because there were fewer people running around the office; it was less chaotic. The weather was great. My husband and I sat out on the penthouse patio most of the day - people were still talking and yammering all day and I just needed quiet. After lunch I sat in the hyperbaric chamber for 1/2 an hour. It basically looks like a small shuttlecraft from Star Trek. You climb inside the pod, lay back on pillows. There is a calming blue light. They attach an oxygen mask to your face and you lay back while the pressure is removed? Put in? I don't quite understand how it works, but it feels like you're on an airplane. My ears popped like I was gaining altitude. I took a short nap, but felt slightly panicky inside. Otherwise, it was boring in there. They have a TV inside, but it doesn't work at the moment. And then it was time for the Squish Pants. 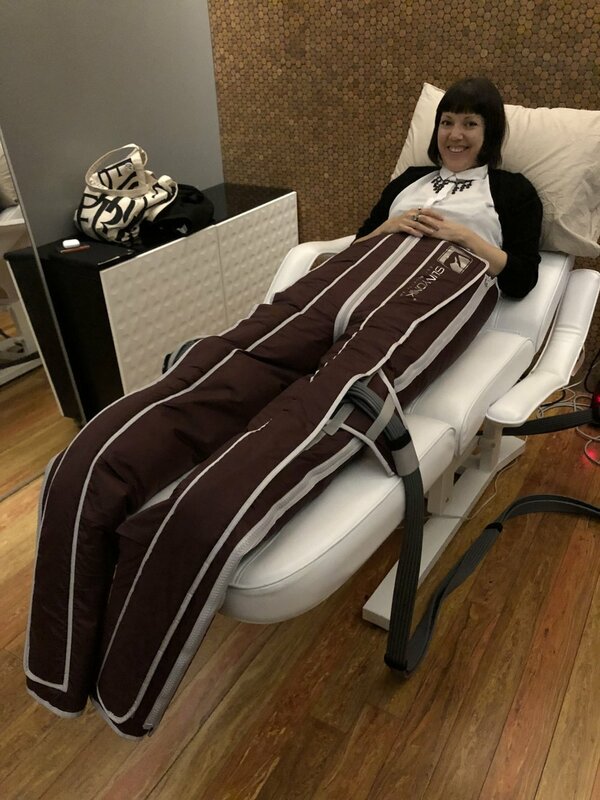 I went into a small side room, took off my pants, put on a pair of paper pants, slid into these heavy puffy pants and laid down. The pants fill with air and it squishes you starting at your thighs and moving down to your ankles. It's a little like those massage chairs at Brookstone. It's not comfortable. It feels like when you're a kid and you play dog pile; just a heavy, uncomfortable pressure. That lasted about 1/2 an hour. It's supposed to help with lymphatic drainage. I will say this, I had a respectable bowel movement when I got home. The thymus injection is one shot in your booty. That's super easy. I don't know what the thymus injection does. Sorry. You get it every day. And finally, the Light Coffin - which they call the "laser bed". It a lighted coffin you lay in for 6-20 minutes. It has random light phases - red light, infrared, that sort of thing. You get naked and lie inside. It doesn't close all the way like a real coffin, but it closes enough that I felt claustrophobic. I didn't feel comfortable with the lid all the way down. The bed warms up, and this is the most relaxing part of the day. The lights themselves are bright, but today I brought an eye mask. Overall, today was easy and was over quick. I also feel a lot better tonight than I did yesterday when we got home. The staff is very nice and accommodating. I'm becoming aquainted with the other Lymies. I'm not there to make life-long friends, but I'm happy to talk to people and everyone is great. I feel like I want to give people their space. There were people there who were on their second week at Infsusio acting like it was a slumber party, cackling, talking. That's annoying. I wish it was quieter, but I only have eight more days to go. Update: When I got home, I had a nice burst of energy, different from how I've felt before. It felt like real energy if that makes sense. However, after I wrote this, I hit the wall. I have a slight headache, shoulder pain, and my ears are ringing. I'm also getting small muscle spasms - all which are normal lyme symptoms. Time for bed. Post questions in the comments. More tomorrow! p.s. I'm kind of poo brained today, so this really isn't my best writing.